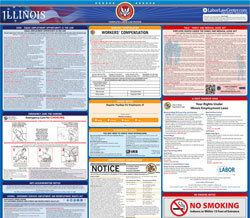 The Notice to Individuals Performing Services for Construction Contractors is an employee classification law poster by the Illinois Department Of Labor. This poster is mandatory for some employers, including construction contractors. This poster, written in English, Polish, and Spanish, must be posted in a conspicuous place where all employees will see it for those under the employment of construction contractors. This poster describes the protections for those who work under construction contractors and what these workers can do if their rights are violated. It appears you don't have a PDF plugin for this browser. Please see the link below to download illinois-eca3in1.pdf.